I rented the iM78s, last year's model (same as the current Peak 78), in a 177 length.? The ski was a good choice as the conditions at Sunshine were a mixture of hard snow; ice with thin layer of fresh on top; and soft spring snow at lower elevations.? Unfortunately the skis had one of those terrible rental store tunes that just ruin the pleasure of being on some really great skis.? The edges were grabbing and catching, so much so that at least once in every second run one ski would catch an edge and take off in its own direction.? Nothing drastic, but VERY annoying.? Couldn't relax and enjoy the day.? It felt like the base bevel was zero, and side bevel was three -- Why can't the rental shops just get it right? It took a few runs and some work with my gummy stone, but eventually figured out how to get the most of out them and not hurl myself over a precipice in the process. 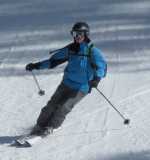 Then the skis showed some of the character that earn them such great reviews. Quick edge to edge (yes, Gary, the 78mm skis can be snappy-quick, to my pleasant surprise), great short turns, long turns, med turns. Very stable and smooth-running.? Near-perfect amount of energy and power in the tail for my size and weight (I'm liking that!!! ), excellent combination of dampness, liveliness and power. Light-feeling underfoot, big sweet spot -- I never felt off-balance or in the back seat.? No speed limit -- really had them flying with wide GS turns on some open smooth runs -- totally calm and non-plussed. Very impressive.? Great handling in soft spring snow / hard snow / icy patches....all over the mountain, in other words.? My only quibble is that on occasion the tails felt like they didn't want to release me out of a turn, but that may be due more to the poor tune and less to the sidecut of the skis. The Watea 78 is not nearly the ski that the IM 78 is. I own these in the 177 size and mine are tuned well and they just rock. This ski will do it all, from tight carved turns to wider GS turns, to skiing bumps and even up to 18 inches of fresh powder. The beauty is the combination of real power and performance (huge rebund and pop when skied properly) and ease of use. I can also tell you that the tails release nicely and quickly on mine so your issue was the tune. On tunes, I am among many that resists getting base grinds. I have had too many that come back wrong or problematic. Almost always when I get a bad basegrind, the skis want to rail. It's really painful and it takes all the fun out of skiing. I have been lucky enough to get to know Willi Wiltz who prepped skis for Tommy Moe and Darren Rahlves during their WC days. I just had Willi put base grinds on 4 sets of skis that weren't right. He is also coming out to Monatan to teach the guys in the shop at my home mountain how to put on a quality basegrind. He also took two pairs of skis that had extensive side edge damage (to the point that I thought they were only rock skis) and they came back looking like new!! High quality ski techs are hard to find. If you ski in Tahoe, Willi had a shop this past season at Sugar Bowl. Next seaosn he will be at Squaw. I know a lot of guys that send their skis away to have them base ground to the Race Place up in Oregon. I totally understand and I will be sending mine to Willi at Squaw if we can't get the techs in Montana up to speed. I am pretty pumped about my newly ground skis. They look awesome and I am sure they will ski great. Unfortunately most tunes and grinds on demo skis were put on by a guy who knows little and cares even less. Too bad because it often prevents people from liking and not buying what is a very good ski. SOunds like a great time and awesome conditions...Now... in the future....when you order your rental skis, tell the guys you expect the edges to be 1 and 3, the base flat cause you're bringing in your true bar....now they just may so "go ...hit in your hat" or hey...they just might do it. So....another 78 undefoot that has potential. Nice! As far as that tail, sometimes a proper detune will allow that tail to release. I have gone to the extra effort with my drummel to round out those tails at the very outside tips even a wee bit more with great success. As far as the Canadian Rockies....definete ly going there next season! Because of a pro PMTS bias, I would guess the IM78 has been skied by many who post here. I bought a pair fully intending to ski them this past season. I did spend one day on them at my local eastern mountain and thought the IM78 to be a very nice ski. A few days later, I did a demo day with Phil and was seduced by the Kastle MX88. Philpug had a customer very interested in the 78 and did a great trade to get me on the Kastle. But back to the IM78, a ski somewhat dated by today's fascination with fatter skis and newer models. No longer any real buzz and it would be ho-humed in an Epic review. I bought mine for less than $200 on Epic and they were used for 2 days and perfect when I got them. But it still skis great for someone interested in carving at some higher speed or in broken snow! Maybe not a true classic ski but they will be seen on the mountain for a long time. A great value ski. We trash some fine equipment much too soon. I have a 20 year old touring bike and it works great riding trails or hills . I couldn't sell it on Craigslist for $150. I'm sure we all have similar equipment stories. It's shameful. Same message with the Italian inflections...!!!!? Everyone here (and pretty much everywhere) knows that I am a huge fan of Head skis. I own many pairs and over the past 5 years they have made some awesome skis. I'm sure the fact that Kastle skis are made in Head facilities has a lot to do with how well they perform and are made (just like Scott Skis are made well by Fischer). I think we all know by now that one's impressions, and subsequent preferences, likes/dislikes of particular skis is entirely subjective.? There are a lot of factors and variables at work here. some tangible, some intangible.? The tangible ones are obvious -- skier weight, ski stiffness, ski dimensions, power and aggressiveness of the skier, skill level, etc......? The intangible ones are things like biases of the skier for or against a certain brand, graphics (yes, it matters, subtly perhaps), and the exclusivity or reputation of a brand in the ski world. In my limited skiing life, I have been on skis that others have hated (too stiff, too damp...whatever), whereas I have loved them -- they work exceedingly well for me, but not for others (eg. my Mythic Riders).? Conversely, I have skied ones that I have hated, but others fawn over and write gushing reviews of (eg. Contact 4x4)....works well for some, but not for me. My point is that it is inappropriate to pan or overtly c**p on another person's preferences for a certain ski or brand, just because it doesn't fit with one's own vision of the "ideal ski" or a "great ski".? If it works for someone, and they like its attributes and the performance suits their needs, weight, ability level and style, helps them become a better skier and enjoy more of the mountain, well then let them enjoy it. Praise them for a choice well made, and just let them get out there and have fun with it.? Everyone is different, and there is no such thing as a single "Best Ski" for everyone.? Live and let live, and let's all enjoy this great sport and not try to foist our biases on others. And a key point in reading ski reviews is, I think, knowing whether or not your "skier profile" matches the reviewer.? Svend doesn't match me, he's bigger than I.
Ron doesn't match me, he's younger than I and prefers skiing? different terrain than I.
Lynn doesn't match me, she's a better skier than I.
Interestingly, Peter's "green skier icon" on the pay site does match me pretty well, and the combination of a "green skier icon" and the "blue skier icon" match me even better.? But if it has the "black skier icon" then it will be a stiffer ski than I like.